Lin Sun is in love with vegetables; she speaks of them as though they were jewels. 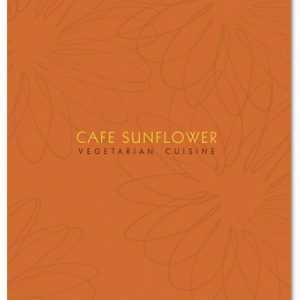 Her restaurant, Cafe Sunflower, is their throne room. “Vegetables are beautiful,” she rhapsodizes, citing the virtues of Chinese eggplant and butternut squash. She launches into a recital of Cafe Sunflower’s wild mushroom fettuccine with sun-dried tomatoes and “homemade” sage oil, cooked in a mushroom stock that simmers for six hours. “Fresh vegetables,” Sun says, “have their own flavors, so they don’t need heavy seasonings or a lot of oil.” She describes a vegetable soup that begins with an all-vegetable stock: vegetables cooked in vegetables, not merely water. “We cannot take it off the menu; people come in every day expecting it.” Then there’s the daily special soup, always made with vegetables in season. A fall soup, for example, might include such ingredients as butternut and acorn squash; root vegetables for early winter; and summer months might bring gazpacho made with plentiful, inexpensive, and wonderfully ripe tomatoes. First she and her husband had a Chinese restaurant, then a Polynesian restaurant in Texas. Then they moved to North Carolina and opened two successful Chinese restaurants in Asheville. Six years ago, Sun officially became a vegetarian, but she’s always been interested in healthy eating-she was a pharmacy major at St. John’s University. No slabs of bland tofu doused in soy sauce for her. “You have to make the food taste good,” she enthuses. And Sun does just that, with fresh herbs and culinary skill. Many of the seasonings are freshly ground in the kitchen. For chili, Cafe Sunflower chefs roast the peppers themselves before grinding. “We don’t buy seasonings premixed,” Sun explains, “because they all taste the same.” By employing freshly ground spices in stunning variety, Sun ensures that no two dishes taste alike. Imagine a Tunisian stew comprising seven-mostly root-vegetables laced with herbs. Or carrots, parsnips, turnips, sweet potatoes, squash, zucchini and chick peas simmered in cardamom, curry, cinnamon, ginger, and paprika.